NCHA Futurity champion High Brow CD, ridden by Austin Shepard for Arthur Noble, held his ground as reigning money earner from the crop of 2004, with a 222-point victory, worth $30,000, in the 2008 Augusta Futurity. The High Brow Cat son, out of a CD Olena daughter, qualified for the finals with go-round scores of 217. 5 and 213. It was his first major limited age event since the NCHA Futurity in December. He�has now earned $280,000. CDs Starlight Ms, by CD Olena, ridden by Allen Crouch for George Moore Jr., was reserve with 219 points. 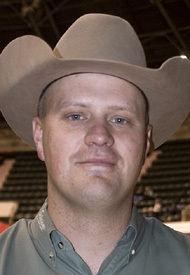 Shepard had won the 2007 edition of the Augusta Classic riding Woody Be Tuff, owned by Lana Peacock, and was a finalist in this year’s Classic on Ginas Cat and San Tule Uno. High Brow CD is one of just two horses to win both the NCHA Futurity and the Augusta Futurity. Chiquita Pistol, who went on to win the NCHA Triple Crown, claimed the 2003 Augusta Futurity. Her rider, Tag Rice, won the 2008 Augusta Classic riding Copaspepto for�Marvine Ranch.